Home Trees and shrubs Centre and Top Bentham's Fan Palm Bottle-tree Butterfly Palm Calliandra Chinese Fan Palm Cocos Palm Cycas circinalis Fern-leaved Grevillea Fishtail Palm Foxtail Palm Ghost Gum Gum tree McDonnell Macrozamia Paperbark Tree Red beech River Pandanus Screw palm Shrubs Books about Australian trees The strange thing about Cycads is, that they are halfway between ferns and conifers and not originally designed for arid areas. However, when Australia became dry and dryer, they managed to adapt. The species we found in the Centre is of course different from the one(s) in Queensland, which look pretty much like the common Cycas revoluta. These are clearly different, not only the colour, also the shape of the leaves. 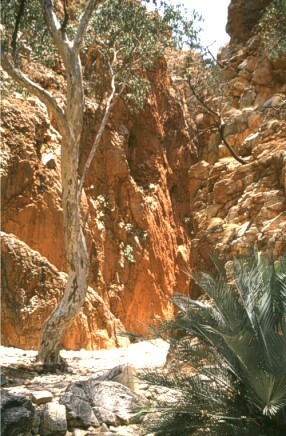 According to the Palm and Cycad Societies of Australia, there is only one member of the Cycads in the McDonnell Ranges. So these ones should be Macrozamia macdonnellii, a plant without an English name. This picture is done in Standley Chasm.